The Northern pine snake (Pituophis melanoleucus melanoleucus) is a threatened species in New Jersey and was the September Species of the Month. The designation was part of a yearlong program to commemorate the 30th Anniversary of the New Jersey Endangered Species Conservation Act and the formation of DEP's Endangered and Nongame Species Program (ENSP). There are four types of pine snakes that can be found in the United States. The northern pine snake is found in the Northern and Eastern-Central regions of the country, in areas with sandy soils and dry upland forests. The population distribution of this pine snake is spotty and all indications suggest that pine snake abundance is decreasing throughout the Northeastern region. The New Jersey Pinelands may provide residence for some of the largest populations of pine snakes in the Northeast, but even in the protected Pinelands this species may be at risk. The northern pine snake is known for being secretive and is therefore challenging to study and detect. This species of snake, which rarely climbs vegetation and prefers to be on the ground, has the ability to tunnel underground and excavate its own nests, summer dens and places to hibernate. Therefore, scientists believe that it prefers the more pliable sandy soils and forested areas of the Pinelands. 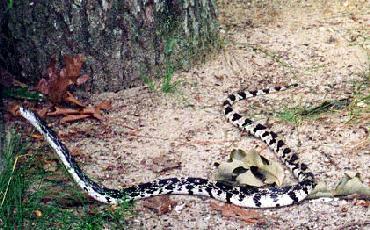 The northern pine snake populations in New Jersey have been affected by a loss of habitat due to development, illegal collecting (due to its popularity as a pet), and other more individualized behavior such as the thoughtless killing of snakes by hikers, automobile drivers and users of off-road vehicles. Department biologists in the Endangered and Nongame Species Program have created a technique for using land cover and soils information to produce maps of potential pine snake habitat. They used scientific literature, information from pine snake experts and the DEP's Geographic Information Systems and wildlife databases to develop the maps. These maps, which depict potential pine snake habitat, have been completed for the southern New Jersey Pinelands. Biologists plan to compare known locations of pine snakes with the mapped habitat to help refine the mapping criteria and guide future management plans. 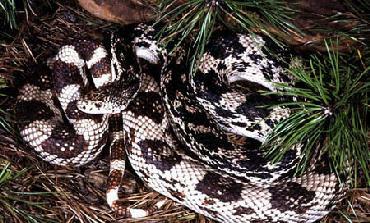 The northern pine snake can grow to 5 feet to 7 feet long and has a black and dull white pattern. There are dark blotches along the top and sides of the body which are less distinct in the front part of the body and more distinct in the hind part. The belly is white with rows of black dots along either side. This species of snake has a small pointed head with a tipped snout and thick neck, which are helpful when it moves soil around or burrows. It also has a special scale at the front of its snout that shields its nose and protects it as it tunnels underground. In fact, much of its time is spent hidden underground. The pine snake is a nonvenomous constrictor. It kills its prey by coiling itself around it in order to suffocate the animal. 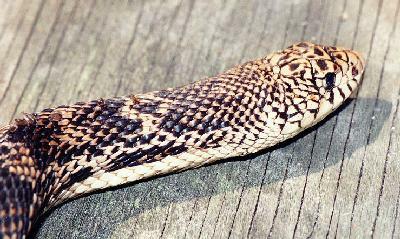 Pine snakes are known to eat mammals as large as rabbits, as well as small rodents and birds. They are usually most active in early morning or late afternoon when they leave their burrows to hunt. 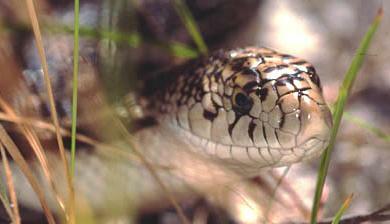 Pine snakes are egg-layers and typically lay their eggs in underground nests that they excavate in open sandy areas. Eggs are usually laid in mid-summer, and adult females have the tendency to re-use their nest sites year after year. Avoid killing a snake if encountering one in a natural area, either when you are traveling on foot or in a vehicle. Back away slowly and do not disturb it. Anyone who is interested in reptiles and amphibians and enjoys being outdoors can become a volunteer with the Herp Atlas Project. Department staff and volunteers are collecting data on the locations and abundance of all reptile and amphibian species throughout the state. This data will be used to map the critical habitat and distribution of these species, which will allow the agency to better plan for the state's wildlife conservation efforts. Attention, observant nature lovers! Department staff would like to learn about your sightings of an endangered, threatened or rare species in New Jersey. To file a report of a sighting, download and complete the Threatened and Endangered Species Report Form. This data helps biologists and wildlife managers to look at habitat and population trends and then develop appropriate conservation strategies. Order a Conserve Wildlife special interest license plate for your vehicle. It's tax-deductible, with 80% of the payment benefiting New Jersey's Endangered and Nongame Species Program. Do you enjoy learning about New Jersey wildlife? Being outdoors? Interacting with the public? Assisting with meaningful volunteer initiatives? If so, join the Wildlife Conservation Corps, the state's largest natural resource management volunteer group. Volunteer opportunities are diverse and include lending assistance with trout stocking; operating check stations; maintaining shooting ranges; and instructing the public. Adults interested in public speaking are also invited to join the Corp's Endangered and Nongame Species Program's Speakers Bureau. The bureau provides speakers to organizations interested in learning more about New Jersey's threatened and endangered species. Want to learn new information quickly about New Jersey wildlife? The Division of Fish and Wildlife offers eight E-mail "mailing list" choices to the public. Visit the E-mail List Subscription Page to learn more about this free service and how to sign up. Join the Conserve Wildlife Foundation and/or make a donation NOW! Check this out for purchase!